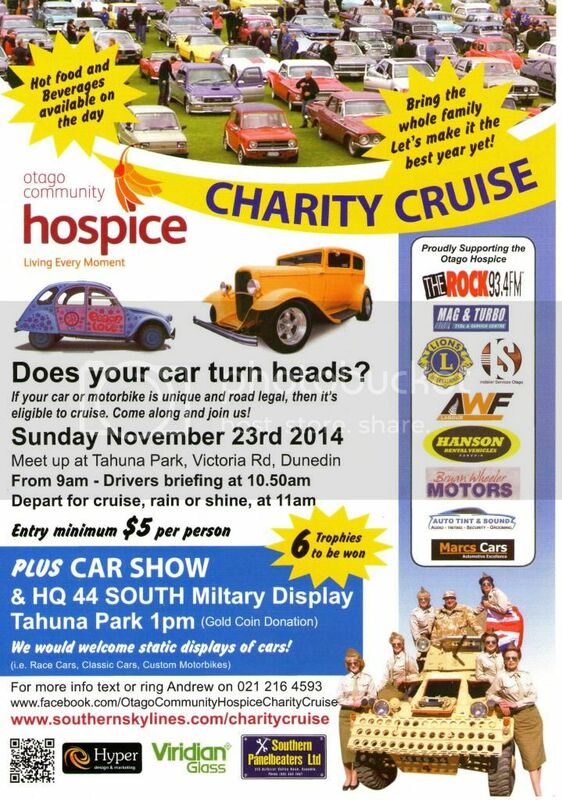 ...you'll be attending the 2014 Otago Community Hospice Charity Cruise in Dunedin, right? We're now in our fifth year, and are hoping that this is the year when it doesn't rain! Last year we allowed motorbikes for the first time, and it was also our best year yet. 180+ cars, 8 motorbikes, $3,655.70 raised for the hospice. Other than turning up on the day, we also would love for people to help spread the word - even to people you see at the petrol station/supermarket/golf course in their Jag, Porsche, GT-R, F350, Harley, Aprillia etc. Theres still been a few marques we haven't seen yet either, Aston Martin, Bentley, Lamborghini, Lancia, Lexus?, Maserati, Rolls Royce, TVR. Had a number of Ferrari's and Porsches turn up over the years, but it's always awesome to get any type of car along! The military guys are putting on a big display apparently and will be offering rides in a tracked vehicle too i think. And we have a couple of raffles on the day, one of them is good if you like being a passenger in fast cars (and by fast i mean nothing less than 500hp), but can only choose one to ride in. Turn up in/on whatever, just be there (please!). Don't have to cruise if you don't want, there will still be people there while we're out waking up the neighbourhoods.